Peter Ames Carlin’s New York Times bestselling biography of one America’s greatest musicians is the first in twenty-five years to be written with the cooperation of Bruce Springsteen himself; “Carlin gets across why Mr. Springsteen has meant so much, for so long, to so many people” (The New York Times). In Bruce, acclaimed music writer Peter Ames Carlin presents a startlingly intimate and vivid portrait of a rock icon. For more than four decades, Bruce Springsteen has reflected the heart and soul of America with a career that includes twenty Grammy Awards, more than 120 million albums sold, two Golden Globes, and an Academy Award. Peter Ames Carlin masterfully encompasses the breadth of Springsteen’s astonishing career and explores the inner workings of a man who managed to redefine generations of music. 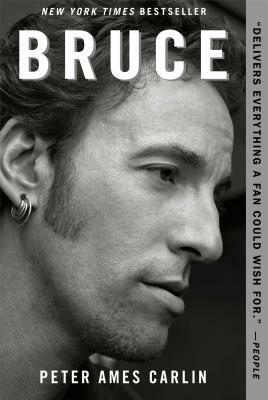 A must read for fans, Bruce is a meticulously researched, compulsively readable biography of a man laden with family tragedy, a tremendous dedication to his artistry, and an all-consuming passion for fame and influence. Peter Ames Carlin has been a senior writer for People, a TV critic for The Oregonian newspaper, and is the author of Catch a Wave: The Rise, Fall, and Redemption of the Beach Boys’ Brian Wilson and Paul McCartney: A Life. Carlin lives with his wife and three children in Portland, Oregon. Visit PeterAmesCarlin.com. "There are probably more books about Bruce Springsteen than there are about any other rock star of his generation. But until one comes out with the words 'By Bruce Springsteen' on the cover, Bruce will be the definitive one." "An epic look at the man and his music." "For all those of us who grew up on the Jersey Shore, chasing Bruce and the band every weekend: the chase is over. It’s all here. Everything we didn't know then -- we're surprised to learn now. It's close, it's intimate -- the master of introspection allows some full-on inspection of his life." “Though not officially an official biography, it's close, with access to Springsteen, his family members and family archives making for a far more detailed and comprehensive chronicle than Dave Marsh's enthusiastic books from '79 and '87." "Springsteen is biographical big game: majestic, fugitive, offering the unwary chronicler the possibility that he might get trampled. But Carlin has brought him down, with empathy and shrewdness. Here is Bruce, stylishly captured in all his Brucedom; the everyman, the unknowable; the anointed one, the loner; stadium swagger and dull, private pain. Are these contradictions, or just the span of a man’s soul? Read BRUCE and find out." "Rock biographer (Paul McCartney) delivers a straight-on, rockin’ and rollin’ life of the Jersey youngster who sold his soul to rock and roll the night he saw Elvis on the Ed Sullivan Show in 1957. Drawing on exclusive interviews with members of the E Street Band, including Clarence Clemons’s final interview, and unrestricted conversations with Springsteen’s family, friends, manager Jon Landau, and Springsteen himself, Carlin takes us on a fascinating journey through Springsteen’s childhood, youth, and his rise to fame out of his early years playing in bands such as the Castiles, Earth, and Child to his most recent concerts in support of his Wrecking Ball album. Carlin energetically drives through the streets of Asbury Park, the bars and arenas around the world where Springsteen continues to work his magic. Carlin gives Springsteen the definitive treatment, and this is by far the best of the many books about the rock and roller, capturing his many moods, his desire to retain his privacy, but his secret craving for superstardom, and, above all, his consummate musicianship and his deep passion for pleasing audiences with rollicking, energetic shows." "Bruce Springsteen has been a muscular American icon for so long it's hard to remember that he was once a scrawny kid from Nowhere, New Jersey, struggling to find his way. Peter Ames Carlin not only brings that kid into sharp focus, he connects the dots between the small-town boy and the superstar he became, in all his memorable incarnations--boardwalk poet, working-class hero, middle-aged philosopher, rock and roll evangelist, political activist. This is the big, expansive biography Bruce's fans have been waiting for." "This is a Bruce bio like no other. Carlin's dogged research, tough-minded prose, and above all, ability to draw out the previously private thoughts of almost everyone involved in this remarkable story combine to transform much of what we thought we knew about Bruce. Carlin's recounting of Springsteen's personal and professional struggles, and those of the members of the mighty E Street Band, make this a quintessential American story and one that will resonate, and inspire, as long as the music itself does." "You can toss those other tomes; Peter Ames Carlin has just penned the definitive biography of Bruce Sprinsteen....A richly researched, extraordinarily entertaining story of one local boy who did pretty darn well for himself." "A solid must-read-thrice for any fan of the superstar....Even for those who have been baptized into the Springsteen 'religion,' the book has major revelations. 'Bruce' is now the preeminent reference in the study of all things Bruce."